Information shows below are only a part of many different events where ECOTONE is/was involved. You are welcome to visit ECOTONE news web page for more info. "Do Science & Get Support"
2nd International Berlin Bat Meeting will be the first European conference to meet us this year! You are welcome to visit our stand and check what is new in our offer!! XXVIII Congresso Brasileiro de Zoologia in January will be the first conference this year to meet ECOTONE team. Please visit us and Ecotone Brazil team in Belem. Sejam todos bem vindos a Belém e ao XXVIII Congresso Brasileiro de Zoologia! 7th Conference of the European Ornithologists' Union (EOU, 21 - 26 August 2009 Zurich) is comming this summer!! Ecotone is going to be there and we will have a lot of special offers for all participants! It's worth to be there with us! The XVII CBO (Congresso Brasileiro de Ornitologia / Ornithological Brazilian Congress 2009) started on 26th of June will be the place to meet Ecotone Team and check our offer. You are welcome to visit us!!! Starting from October new ultrathin mist nets are available in our offer. Now you may use both 14mm (14x14) as well as 20mm (20x20) mist nets made of single thread nylon. In addition new sizes of nets are available - from 2 up to 21 meter!! Details <here>. OLD MONOFILAMENT MISTNETS CODE HAS BEEN REPLACED! 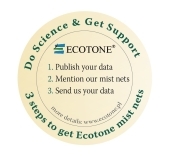 Now 08M nets are coded as M-14 - please use search engine on ECOTONE web page to find monofilament mist-nets.